“What color would you call my hair?” I asked her once. “Mouse”, she quickly replied, so I made her a giant wire sculpture of a rat. We found that we could laugh at each other until the tears flowed down our cheeks, and not remember why. She was a girl from a village I never heard of and a culture I only guessed at. I painted pictures of Indians I had never seen, in landscapes I had never traveled, until she became my daughter’s teacher. On “Back To School” night I met Georgia Oliver, fifth grade teacher, and as my daughter had told me: “A REAL Indian”, as opposed to what I had painted. Georgia and her husband, Emmett Oliver, became extended family over a period of time, and together introduced us to Native America. Georgia Abeita came from Isleta, a small pueblo in New Mexico, and Emmett, a Quinalt, from Washington state. Both became teachers and there are untold numbers of former students who are grateful for having had either as their teacher. Their son, Marvin Oliver, has carried on the teaching profession as Art Professor at the University of Washington, and has become famous as a North Coast artist. A turning point cor me as an artist came when Georgia invited me to spend time with her at her home in New Mexico. From that time on, I no longer had to look for pictures to copy when painting an Indian. More important, I found a very special friend. For those of us who love dogs, it’s nice to know that a cemetery in San Luis Obispo “On a bluff beneath tall oak trees and overlooking green rolling hills is a resting place and place of honor for those who sniffed out crime and brought down crooks. Here police dogs from one California agency are laid to rest.” I’m grateful to Sue Manning from the Associated Press for this information. This cemetery for K-9s in San Luis Obispo is unique among U.S. law enforcement agencies. It is more common for dogs to be buried or their ashes scattered on their handler’s property or a pet cemetery. No matter where they end up, dogs who are killed in the line of duty usually can expect to have a funeral similar to that of a slain officer, according to Russ Hess, national executive director of the United States Police Canine Association. This means a service with eulogies, a color guard and the playing of taps. After all, dogs are members of the patrol force, living with their handlers and their families. In some cities when an officer retires, his dog is retired as well, and for a payment of one dollar, goes with him. 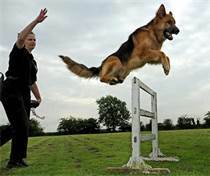 A friend of ours in Newark, California has been training German Shepherd dogs for the police department for many years. The basic characteristics of the German Shepherd make him uniquely qualified for K-9 work. It takes more than just their intelligence and good looks to get them hired for the job. Traits that set them apart from the other breeds include a natural curiosity, athletic ability and the desire to perform a job. 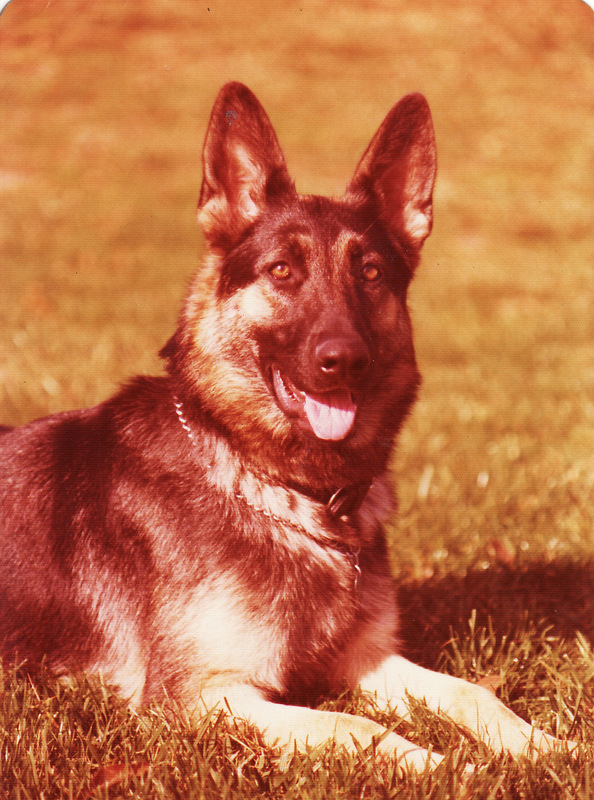 Many years ago when I bought my last German Shepherd, a police officer in my neighborhood told me that given enough praise, she would break her back for me. Her loyalty was unquestioned and incredible. This is why there are more German Shepherd police dogs than any other breed. In larger cities, a K-9 team has many more police dogs so that each one can specialize in a single area such as weapon detection. In smaller towns that only have a single K-9 dog or police dog make it necessary for that one to receive training in all areas of police assistance. This includes drug detection, sidewalk patrolling, suspect apprehension, and corpse finding missions. German Shepherds are quick at learning hand signals by sight, and they eagerly obey commands given by their owner. I must admit to being a bit of a show-off because I enjoyed placing our last German Shepherd on a spot telling her to stay, while I ran to the other side of the lake, perhaps a quarter mile away, and used only a hand signal to get her to come to me. It shows the intensity of their focus, that she never took her eyes off me. Of course, this was before our population swelled and that walking path is now like a crowded freeway. I would no longer dare to do that, and certainly not with a Jack Russell Terrier. In the San Luis Obispo cemetery, even dogs who die in retirement go to their final resting place here. Cmdr. Aaron Nix said “The K-9s are deputies” and this was our way of making sure they are honored. To acquire the land for the cemetery was an easy sell. Confiscated drug money funded the memorial park and jail inmates helped. Now the K-9s have a place waiting for them. Jake, a drug-detection dog with 900 credited arrests was the first buried there with full honors. These dogs evoke an outpouring of emotion and a funeral is well-attended by locals who appreciate the service they have given the community. When residents of a town in New jersey learned a K-9 named Judge had Cushing’s disease they raised more than $12,000 in two days last year for his treatment. The German Shepherd caught 152 suspects in a seven-year career. When Judge could no longer get up, his handler, Cpl. Michael Franks, took him to be euthanized. As he carried Judge into the veterinarian’s office last month, nearly 100 officers from across New Jersey lined up to give the dog one last thank you. The German Shepherd in the top picture is our Eliza Jane 11, (Liza), Not a K-9, but still, the Queen of our kennel and Princess of our pack. My cousin Kendall passed away this past year at the age of sixty-one years as we count chronologically, but he never grew up. Kendall was born in Dhahran, Saudi Arabia, and had Down Syndrome. His parents, my aunt and uncle, lived over seas for thirty years, and nothing much was being done at that time anywhere in early education for the mentally handicapped or the parents. Abnormalities in a birth always come as a surprise to parents happily looking forward to a life filled with so-called normal expectations, but to older parents living in a third world country, Kendie’s birth was heartbreaking and unexpected. Down Syndrome is a genetic disorder caused by the presence of all or part of a third copy of chromosome 21. It is typically associated with physical growth delays, characteristic facial features, and mild to moderate intellectual disability. The average IQ of a young adult with Down Syndrome is 50, or equivalent to the mental age of an 8- or 9- year old child, but this varies widely. Education and proper care have been shown to improve quality of life, ideally from birth on. In the past, the life expectancy was about 30 years, but now it is about 50 or 60. Down Syndrome is the most common chromosome abnormality in humans, occurring in about one per 1,000 babies born each year. It is a lifelong condition, but with care and support, children who have Down syndrome grow up to have healthy, happy, productive lives. Fortunately so much has changed in public acceptance of the mentally challenged. A hundred years ago, these people were kept in a back bedroom, and lived out their brief lives alone and unseen. It was assumed that they were incapable of learning, and even their existence was kept a somewhat shameful secret. Education and proper care have been shown to improve quality of life. My daughter earned her college degree in the study of the mentally challenged, some of whom had Down Syndrome. Specialized education is a wide open field and now some children with Down syndrome are educated in typical school classes. Some individuals with Down Syndrome graduate from high school and a few attend post-secondary education. In adulthood, about 20% in the U.S. do paid work in some capacity with many requiring a sheltered work environment. About 35 years ago, a friend with two young sons called early one morning to tell us of the birth of a fourth son. This family prided itself on building good health, strength and athletic ability. Each was proficient in sports. As Dr. Advice answered the phone, I caught a slight change of expression as he said “Maybe God thought you needed a cheerleader for your basketball team.” He had promptly diverted the conversation from one of mixed feelings into one of positive anticipation. Their fourth son had Down Syndrome. At the time the University of Washington had a concentrated study of the condition, and the mother of this child went there from California and learned what was being done to educate babies from birth. Instead of waiting for several years before teaching basic skills, Blair began immediately being prepared to live in the mainstream of society. Before speech, he was taught sign language, which hastened his communication skills. As soon as possible, Blair’s mother took him into school classes and introduced him, explaining to the students that he had Down Syndrome and what it was. When old enough, he was enrolled in school and treated just as any other student. He was never made to feel “different” or out of the loop. His mother organized a baseball club made up of mentally challenged children, which developed their concept of team play, and their natural joy in physical activity. She even went to members of the Oakland Athletics professional baseball team and appealed to them for pieces of athletic equipment, which they gladly donated, taking the little team under their wing. To see Blair today, with his show of confidence and compare him to Kendall, a lot can be attributed to his early training. Years ago, when Blair was about 5, I received this poem from one of his older brothers while he was a student at U.S.C. Brother so kind, how can it be? Brother “What happened? How come he can’t see? Brother I’m sorry; you will never be like me. Brother your life will set me free. Mother please, the blame will never be known. Mother in this life, the harvest can not be resown. Mother worry not so much for him. Mother cry more for me and Tim. Father others expectations may run too high. Father friends will come, fear, and say goodbye. Father they say patience and time can only tell. Father without you, his life will surely be Hell. Grandpa, has Peter now become your best Friend? Grandpa, how come you never stayed till the end? “You shall walk two paths…yours and that of the White Man. Pick up those things from the White Man’s path that you can use.” Wise words from Sitting Bull. 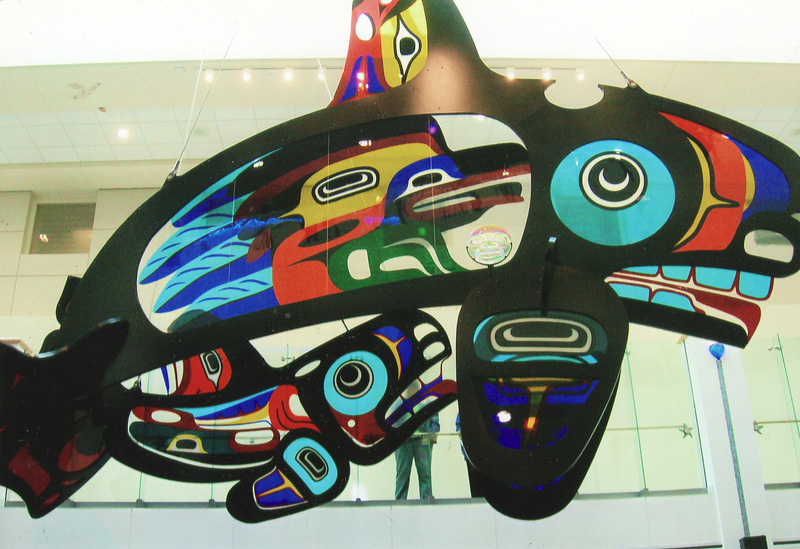 Stories are the core of Northwest Indian culture and education, and have been for at least 8,00 years. Emmett Oliver’s story is of one Northwest Indian who was poor, dropped out of school, returned, got two college degrees, and revolutionized Indian education in his native state. 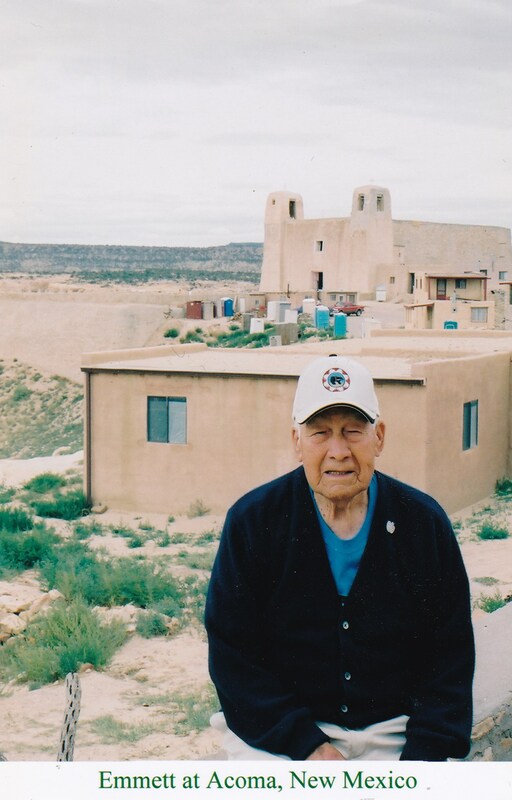 Like many American Indians, Emmett Oliver grew up off the reservation. His unique personal experience combines the best of two cultures and has contributed to each. He has truly followed two paths. “She came more than a thousand miles and a lifetime of years for the event. Her eyes found her youngest son, handsome and proud in his cap and gown.” These are the opening words of the book “Two Paths”, commissioned by Emmett and written by his friend Ben Smith. Emmett paid for the publication of the books and then gave them away to all Indian schools in Washington State, as an example of what successes could be achieved by education. After a college sports career, someone suggested that Emmett might consider becoming a teacher. What followed was a lifetime of teaching and counseling both high school and college students, and in encouraging children from Northwest Indian communities to pursue their education. After the second World War, Emmett returned as a Coast Guard Commander. Handsome, dignified and charismatic, he resumed teaching with his wife Georgia. They both came as educators to California, where we became friends more than 55 years ago. They were my introduction to Indian America. 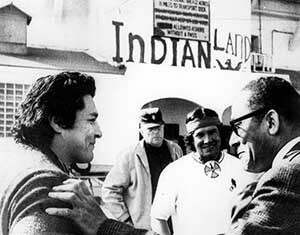 In November, 1969, Indian tribes occupied Alcatraz Island and its abandoned Federal prison in San Francisco Bay. One of the leaders of that movement was Emmett Oliver. He was Chair of BANAC (Bay Area Native American Committee.) the organization that spearheaded the takeover which lasted 19 months. The takeover was a reminder to many (including Emmett’s son, Marvin) of their Indian heritage. The takeover led to Emmett’s attendance at the National Indian Education Conference in Minneapolis with a large number of prominent Indian educators, where Emmett was encouraged to return to his involvement in Indian education. This led to directing the Indian student programs at UCLA. His mother’s drive for her children to be educated had re-emerged and in that moment his whole life came into focus. He would devote the rest of his life to Indian education. In the summer of 1970 Emmett joined the Division of Minority Affairs of the University of Washington to head the Indian Student division. His first task was to recruit and counsel Indian students. 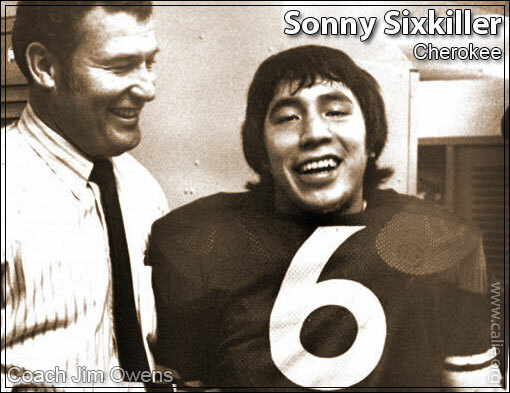 At that time, Washington boasted a full-blood Cherokee role model named Sonny Sixkiller, who was their star quarterback. Our daughter was then a student at the University, and a friend of Sonny. Emmett’s effectiveness brought him to the attention of the Department of Education for the State of Washington and he was hired as the first Supervisor of Indian Education for the State. This gave him a greater opportunity to work more closely with the Indian communities. 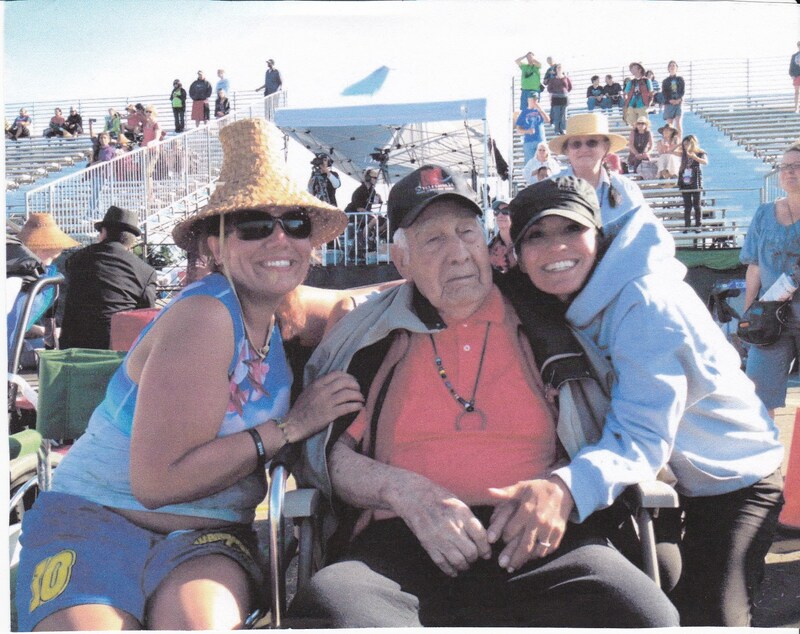 The first great “Paddle To Seattle” in 1989 that Emmett conceived and coordinated was the Native American contribution to the Washington State Centennial. It was a celebration of Indian culture, and through the annual canoe races, it has culminated in well over 100 canoes from various Northwest tribes participating each year. Emmett’s daughter, Marylin has been heavily involved in the races, working tirelessly with participants all over the State. She is currently a Seattle Delegate to the City of Perugia, Italy. 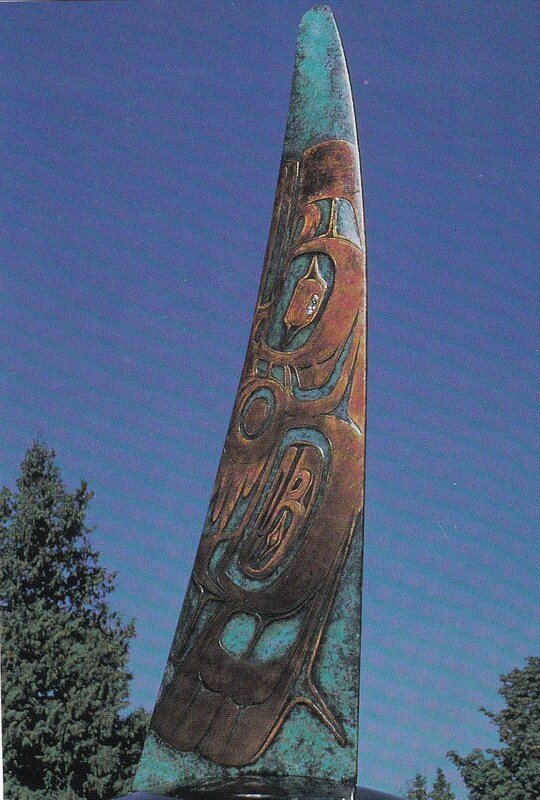 Emmett’s son, Marvin, is a Professor of Indian Art at the University of Washington and at the University of Alaska and an artist whose massive sculptures can be seen in many places around the world. “Spirit of the Future” Public sculpture by Marvin Oliver, in Perugia, Italy. Emmett’s is a spirit venture, drawing on the past and enlightening the future. His innermost being believes you cannot teach someone you do not love.